This style of virtual world could best be experienced in the explosive indie darling Minecraft, in which players are plunked into a random paradise of their own naming, tasked with one thing, and one thing only - survival. (Well, and killing a dragon.) The game world consists of nothing more than open space and multitudes of beautifully colored cubes, each of which can represent dirt, water, sand, stone, or even zombies out to eat your brains at night. 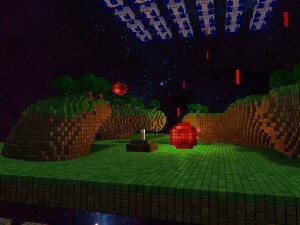 Markus "Notch" Persson's creation has spawned a number of "minelikes," all of which attempt to emulate the voxel-based style. 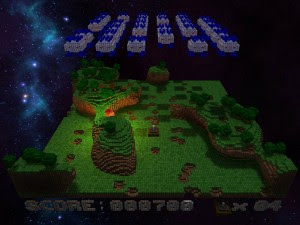 Another interesting spin on the model is Lexaloffle's Voxatron, a dual-stick style shooter taking place in levels constructed entirely of voxels - all as destructible as your player and the enemies you destroy. For fans of the humble yet undeniably powerful voxel, it was nice to see something other than a Minecraft-style sandbox utilizing the form. 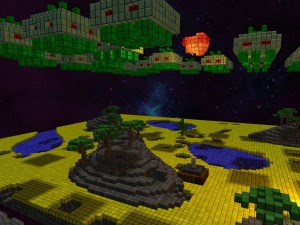 Thus, my interest was strongly piqued by Voxeliens, a title promising to present "Space Invaders as it wishes it could have been." The team behind the game, Volumes of Play, found its beginnings as a technology company. Their engine, PolyVox, is an open source voxel terrain library written in C++ and is also what powers Voxeliens. Developer David Williams graciously allowed me to test the final polished version of Voxeliens, but does it deliver on its promise? Gameplay is simple, but does expand on the formula of the original by adding various poweups, including a fantastic laser beam which gives you the power to vaporize a "line" of aliens vertically in 3D space, or a destructive spread shot. 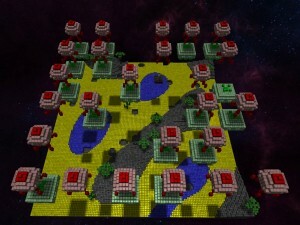 Plus, the introduction of this play style into a voxel based world allows for terrain to play a part in the level. For example, a rock bridge or cave can give momentary shelter from a xenomorph's bullet attack - while impassable objects could trip you up for just as long as it takes to get iced by a stray projectile. The game isn't as easy as it appears at first brush - one may think all they really have to do is "shoot the shadows," but navigating around the varied terrain in order to line up a shot adds another layer of depth and challenge. There are a variety of ways that the ship can be controlled, but I found the fastest and most responsive way to be mouse control, enabling me to deftly dance around the deadly barrage of alien firepower and systematically eliminate the intruders. I felt the game was far too easy at first (even on the hardest setting) but as the levels progress it begins to get dicey, the hordes of invaders growing continually larger, and moving ever more quickly. Overall, it's very simple to heartily recommend Voxeliens to any Space Invaders or retro-shooter fan, and by retro I mean late 70's/early 80's style retro. This title may be too simple to have any lasting appeal to those of a newer generation of gamers, which brings me to the game's simultaneously best and worst feature - its purity. Voxeliens doesn't expand much on the gameplay of olden day shooters; many things could have been added to really transform this title, such as randomized levels, big bosses, terrain editors, etc. 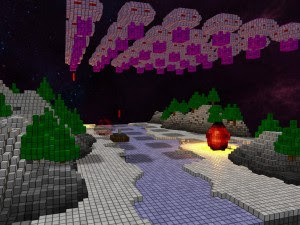 However, when I consider the bargain price (currently $4 USD/£2,5 GBP), the smooth voxel graphics, and solid bite-sized gameplay, Voxeliens is still worth a purchase, and is a welcome diversion when you have a few minutes available to blast some antennae'd critters from the sky. Download the demo/buy the game here (from the Volumes of Fun website).